I had the best date ever this Valentine, with mother dearest 🙂 beat that if you can!!! 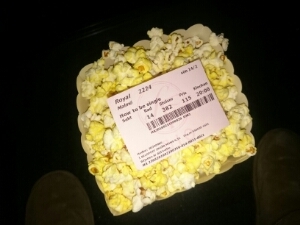 It was us and every single teenage girl in Malmö that sat down for good laughs delivered to us by How to be single. Of you need to laugh, go see it! It’s a picture of a movie ticket on top of popcorn , How to be single is a comedy that’s out at the theaters here in Sweden now.